When this writer (Lyle Derscheid) was inducted into Company 2756 at Farm Island on August 31, 1935, the causeway had been completed, a Girl Scout cabin of rubb1e-masonry was nearing completion, and the Lewis and Clark monument that commemorated the 1804 visitation by that expedition was being readied for its dedication. One crew was back-sloping the south shore of Lake Hipple; another was clearing wild roses , poison ivy, and other brush from an area being developed for a picnic area; and other crews were working in the tree nursery and starting the construction of the dike at the foot of the island. During the next year t here were generally five crews in operation: (1) the tree nursery crew that produced tree seedlings and also dug, balled, and transplanted cedars whenever needed for landscaping in newly developed areas ; (2) a construction crew that erected buildings and built fireplaces; (3) a brush hook crew that cleared the brush from areas to be developed and provided material for the construction of wing dikes; (4) the dirt crew that included the operators of the caterpillar, excavator, six dump trucks , and the dump bosses that built the dike at the east end of the island, sealed a leak in the Arikara dam, and delivered black dirt or fill dirt for the landscaping of developed areas, construction of wing dikes, and the building of the greens f or the golf course; and (5) the rock crew that dug rocks from the hills across S. D. Highway 34 more than a mile north of camp--rocks that were used for building rubble masonry structures and wing dikes. Camp S-207 was established in 1933. 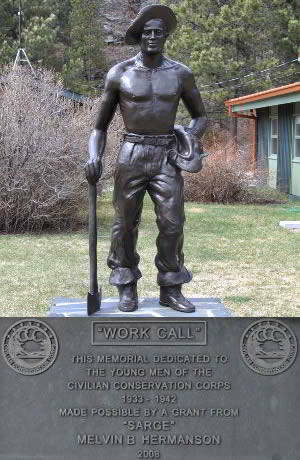 The first men stationed here was an African Americans company from Kansas City, Missouri. Many townspeople were afraid of the African Americans, causing the local politicians to get them transferred. They were replaced by a company of North Dakota hoys. Some people complained about the North Dakotans, too. Eventually, companies of South Dakota boys would inhabit the camp. 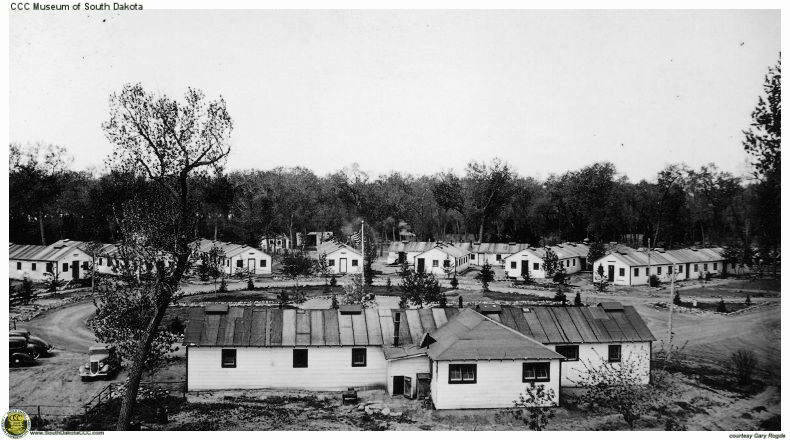 The camp was laid out in a U-shape and contained around 24 buildings. Local carpenters built most of the buildings, as the green recruits were not skilled enough to build the camp yet. The United States Army administered the camp and Reserve Army officers were in charge. Most enrollees found that the reserve officers were no stricter than your average factory foreman. The camp closed in 1937. The city took control of Farm Island and eventually transferred it the State Department of Game Fish and Parks. 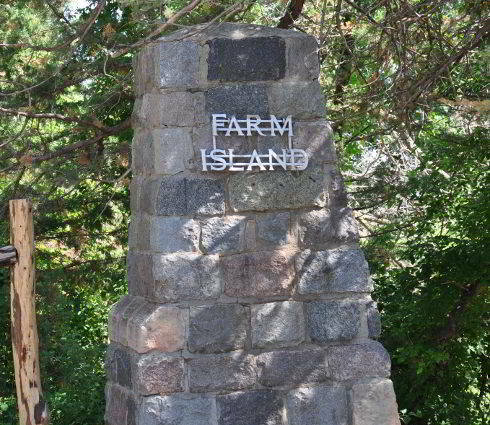 The United States Government took Farm Island when the dams were constructed. At this time, many ot the old CCC buildings were removed or destroyed. Sponsored by South Dakota State Parks; the South Dakota State Historical Society; a Preserve America grant and the Dakota, Minnesota and Eastern Railroad Corporation. 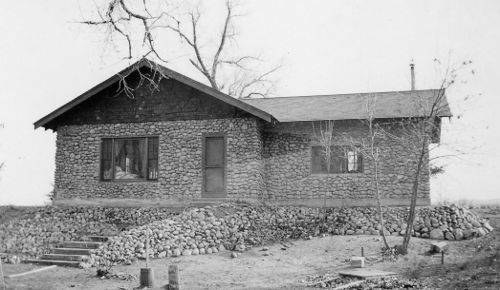 Images courtesy of the South Dakota State Historical Society.